Launched in 2012, MAIZE is a CGIAR Research Program (CRP). The 15 research centers generate and disseminate knowledge, technologies and policies for agricultural development through the CGIAR Research Programs. The CGIAR Fund provides reliable and predictable multi-year funding to enable research planning over the long term, resource allocation based on agreed priorities and the timely and predictable disbursement of funds. The multi-donor trust fund finances research carried out by the Centers through the CGIAR Research Programs (CRPs). Led by the International Maize and Wheat Improvement Center (CIMMYT), with the International Institute of Tropical Agriculture (IITA) as its main CGIAR Consortium partner, MAIZE focuses on increasing maize production for the 900 million poor consumers for whom maize is a staple food in Africa, South Asia and Latin America. MAIZE’s overarching goal is to double maize productivity and increase incomes and livelihood opportunities from sustainable maize-based farming systems. It also builds on the new cutting-edge collaboration established internationally to unlock the black box of genetic diversity in maize through ‘Seeds of Discovery,’ and on the continued success of further elevating the stress tolerance of maize in Africa, with similar efforts now becoming stronger in Asia and Latin America. What makes MAIZE CRP unique? MAIZE unites its partner institutions in identifying a uniquely strategic approach to address key challenges in maize-based systems. These two research strategies coordinate work on four Flagship Projects, covering maize-based farming systems, drought-tolerant varieties, better targeting for new technologies, policies, post-harvest management, precision agriculture and institutional innovations. 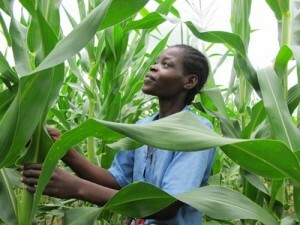 Women play an important role in maize-based systems in all the regions where we work. In Africa, social and economic trends have also driven a significant rise in the numbers of female-headed households. However, persistent inequalities mean that female farmers achieve yields that are on average 20 to 30 percent lower than those of men. This means that it is essential to address gender disparities in order to achieve our development goals, with strategies that are aware of how interventions may affect men and women farmers differently. The Gender Strategy is an important component of MAIZE designed to integrate gender awareness into our research strategies, promote more engagement with women and young farmers, and integrate gender awareness into the CRPs themselves. MAIZE looks at the whole picture of how knowledge is produced and used, seeing research as one element in the process of innovation. Many projects in MAIZE make use of “Innovation Platforms,” and MAIZE is investigating how to ensure that these and other project elements connect stakeholders with the research they need. Learn more about Agricultural Innovation Systems in MAIZE. Stable window 1 and 2 funding enables us to react quickly to urgent needs as well as improve program level coordination and learning and ensures that the greatest possible impact is realized.